Liam has dyed his hair green, red, and blue. Brian did purple. Cad hasn’t yet put together that the Cloaked Serpent is the Wildmother’s mortal enemy. “I don’t think he necessarily believes that that’s what’s happening yet.” Even as Taliesin, he isn’t entirely convinced. Gif of the Week: the beheading of the hydra. Fanart of the week: the beautiful orchard chamber. Taliesin on Travis’ ‘Molly’ slip-up: “Honestly, there’s very few things in the world that delight me more than seeing a little bit of shame roll down his face.” He purposely made an offended face at him. That moment delighted him. 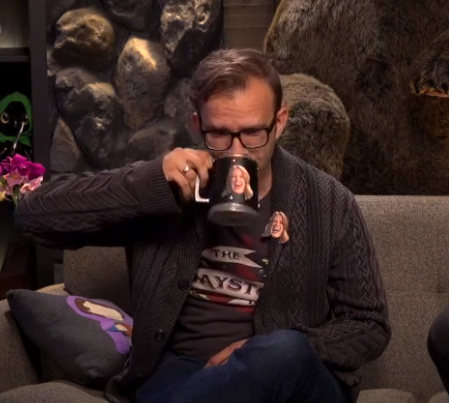 Taliesin specifically made a character who bonds easily with people. He loves knowing things about the characters but being able to back off from that and feign ignorance. What books would Liam keep in Caleb-esque holsters with him at all times? Hellboy: Seed of Destruction: Vol. 1, and Complete Works of Shakespeare. It would be a little unbalanced. If he could only pick one Shakespeare play, it’d be Hamlet. How would they defeat a Marisha hydra? Taliesin, instantly: “Could not be done.” He and Liam concoct a plan involving the right margarita, turkish delight, a pickletini, red wine, Minecraft, and giving one-sheet pitch docs to three of the heads. Molly would’ve had two of the fruits, “just to make a point”.